The holidays are filled with social gatherings, family dinners and opportunities to connect and share the joy of the season. But with this festive season also come land mines that are within every family -- all this togetherness can sometimes backfire. So, how do we avoid this meltdown? Here are some tips to assist you in keeping the family peace during the holidays. The holidays are filled with social gatherings, family dinners and opportunities to connect and share the joy of the season. But with this festive season also come land mines that are within every family -- all this togetherness can sometimes backfire. Just when you thought you might be basking in the bliss of family connection and caring, you may actually find yourself in the middle of a family meltdown. For many, this meltdown is one of the most feared events of the season. As a Child and Family Therapist I encourage making family time a priority. It is important to know our roots, and multi-generational family gatherings bring us a sense of identity, support and love. Family loyalty, family connection and attachment secure us in this world. Every family has its history, and within that history one will find a mix of powerful emotions. It is not unusual to find a residue of frustration and suppression amongst the mix. Under the pressure of the season, and the heightened emotions that often come at this time of the year, you might hit a land mine before you know it and the idyllic family gathering may then turn into a hot mess of emotion. So, how do we avoid this meltdown? Here are some tips to assist you in keeping the family peace during the holidays. 1. Accept that there will be ups and downs. Anticipate that the emotions are heightened during this time of the year, and you can expect a bit of a roller coaster. Do not set yourself up by aiming for the perfect Christmas with all the fixings. Family members will bring out our strongest emotions because we care about them and we care about what they think of us. 2. If an issue comes up, look for solutions rather than add to the complaints. Just because somebody else is being negative does not mean you have to get caught in the web of negative emotion. 3. Even if you do not agree with somebody let them know that their point makes sense. The best way to disarm a potentially upsetting situation or person is to validate. Once you let that person know that what they are saying, or feeling, is valid they no longer need to prove their point to you so strongly. 4. Do not give advice to others; it only annoys people and brings up resentments. 5. Do not take everything personally. Although you may be surrounded by your family, remember that their behaviour belongs to them and does not define you personally. Everyone is human and everyone will make mistakes. Just because somebody is saying, or doing, something that upsets you it does not mean that it was done intentionally to upset you. 6. Do not let your well-being be dependent on others feelings joyful and happy. Live and let live. Remember your boundaries and respect the boundaries of others. 7. Christmas is filled with family traditions -- there has been much advice given over the years on how to set your table, cook your turkey, raise your children and wrap your presents. If someone is giving you advice that you do not want, just politely express your appreciation for their ideas and move on. Do not dwell on this. 8. If you cross a line, or lose your cool, model how to take responsibility for this. You too are human and might get caught up in the family drama. If you have something to own then own it. Do not be afraid to say sorry -- it is actually quite liberating when you really mean it. 9. When you are in the midst of a family gathering, watch you alcohol intake. This can be the trigger that sets off the fireworks. 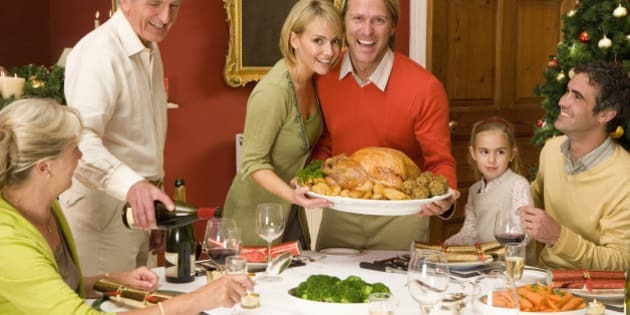 The combination of a large group of people with suppressed emotions, mixed with a lot of alcohol, could make for a messy Christmas dinner that requires a lot of emotional clean up afterwards. 10. When you see conflict arising, look for ways to get out of the middle of it. This might mean getting out of the conversation, moving to another room or wrapping it up for the night. Do your best to be respectful to everyone, but when things start to go south get out of the way. Remember, although these family gatherings may cause some stress and trepidation in the end it is the connection and caring of a family that launches us and supports us in this world.